The Cranberry Mountain Lodge is a tranquil, isolated retreat for outdoor enthusiasts in the mountains of West Virginia. 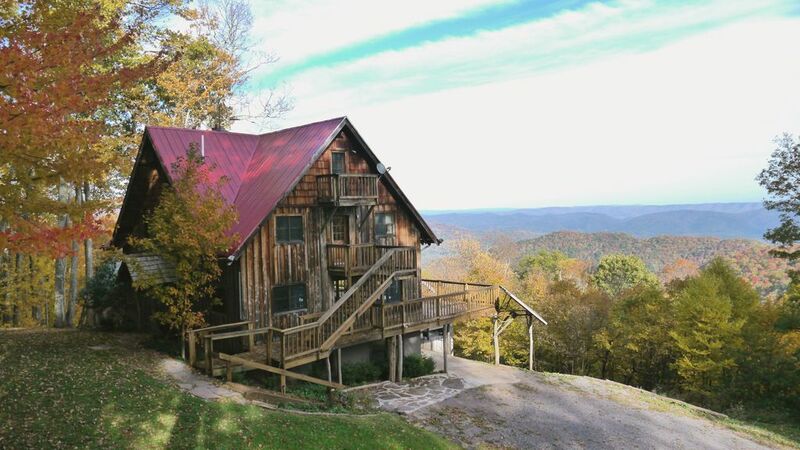 Rent the Cranberry Mountain Lodge and get an entire Lodge and Mountain to yourself! The Cranberry Mountain Lodge is one of the most unique lodging experiences in the U.S. Located at 4,000 feet elevation on top of Cranberry Mountain, the lodge adjoins nearly one million acres of national forest. The views off the deck are spectacular, exceeding 40 miles. You can hike, bike or cross country ski right out the front door to a vast trail system. The lodge is very spacious and isolated, with the nearest neighbor being 2.5 miles away. When you rent the lodge, you rent the entire seven-bedroom facility, so you get the privacy you deserve. Rates are based on the number of guests and length of stay. The Cranberry Mountain Lodge is a bird-watcher's and nature-lover's paradise. Actual Location: 1692 John Wymer Road, Hillsboro, WV or 815 Cranberry Mountain Road, Hillsboro, WV. Winter Warning: You must have 4WD/AWD in winter months. Otherwise, you will get stuck, due to ice in the Parking area, Switchbacks on the mountain, etc... Chains plus 4WD/AWD is the only combination to assure access with icy conditions. Hot Tub Disclaimer: The Hot Tub is a Large - Hot Tube Shell, with No Jets. Fill it like a Bath Tub(2 hours), then Drain. Sorry to Disappoint anybody looking forward to a Hot Tub with numerous Jets. The Lodge is OFF Grid(Solar Electric). Not enough Electric Capacity to Run a Water Pump. Solar Electric Disclaimer: Electric Consumption must be limited to Two Large Amperage devices at once. Can't use Microwave, Toaster, Electric Griddle. Coffee Maker, Hair Dyer, etc.. all at once. Must limit to 3,600 Watts at once, otherwise you will 'Trip' a Breaker'. Added in the Spring of 2017, DSL-Internet. Pay On-Line Only. Do not attempt to mail payments. I am a 4th generation West Virginian that wanted to build a remote Lodge near the National Forest. We love the 'cool' temperatures of the mountains. We wanted property with no neighbors. We found it. Nearest neighbor 2 miles away. We began building in 1990, 4 years later we opened. Over the years we have made several improvements; more solar panels, hydro electric , trout pond, etc.. Love the WV mountains and you will too. Entirely Off the Grid; Solar, Hydro and Wind Power the Lodge. Adjacent to a vast National Forest & Trail System. Amazing stars at night. No bugs. Really. Sit on the deck without getting 'eaten alive' as visitors to other vacation destinations will tell you. Very unique lodging experience. DSL added in January 2017! Outside Hot Tub, No Jets.